Glenavon player/manager Gary Hamilton says winning the Irish Cup final against Ballymena United would be the pinnacle of his career in the game. 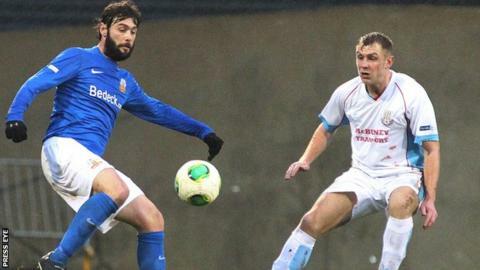 The Lurgan Blues are seeking a first success in the competition since 1997 while Ballymena were winners in 1989. "I'd swap everything I've done in the game to lift the trophy - I've followed Glenavon all my life," said Hamilton. "There is no favourite or underdog, the teams are similar and it could be a great final at Windsor Park." The Sky Blues progressed to the decider thanks to a 3-0 win over minnows Queen's University while Glenavon beat Crusaders 3-1 in their semi-final. The Glenavon team boasts a mix of youth and experience with former Portadown team-mates Hamilton and Kyle Neill among the Lurgan Blues players to have tasted Irish Cup success. "There's a lot of winners in our squad - when I came to the club I brought in players with a winning mentality," added Hamilton. "Some were a bit older and some people questioned why I signed them. "I think getting to the final and their influence in the changing room has proved why I did it. "The boys have been buzzing and while many have played in a final, the one's that haven't can't wait for the day to come." The mood is also upbeat in the Ballymena camp although manager Glenn Ferguson is wary of the threat posed by his former club. "The lads are training hard and they've got measured up for their suits so there's a wee buzz about the place," he said. "Glenavon are a good, strong side and in Guy Bates they have a matchwinner, while Mark Patton has come on and changed games. "I was lucky enough to play three finals in a row and each one was a really special occasion. "I want the players to enjoy themselves, put on a good show and ultimately bring the big prize home. "It is going to be a tough game, hopefully no-one will freeze and it will be an entertaining final - may the best team win."